I came across an interesting article by Alan R. Sandstrom on FAMSI the other night. 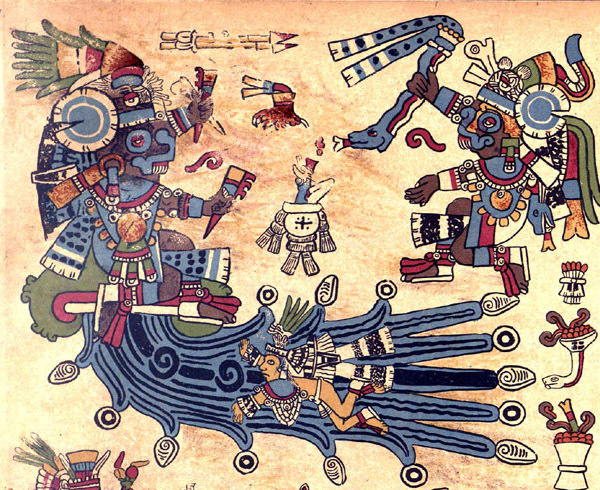 It is a summary of his observation of a modern Huaxtec ceremony honoring one of the Tlaloque, a rain spirit named Apanchanej (literally, “Water Dweller”). This festival took place in 2001 on Postectli, a mountain in the Huasteca region of Mexico. A bit of background — the Huaxtecs are an ancient people, neighbors of the Aztecs. Like the Aztecs, they spoke and still speak Nahuatl, making them one of the numerous Nahua peoples. To this day they still live in their traditional home, one of the more rugged and mountainous sections of Mexico. They have retained more of their indigenous culture than some of the other nations that survived the Conquest due to their remoteness and the rough terrain that inhibited colonization. This includes many pre-Conquest religious traditions, even some sacrificial practices. If you would like to read the article in English, please go HERE. Si desea leer el artículo en español, por favor haga clic AQUI. This article includes discussion of several details of particular interest to those interested in learning from the living practice of traditional religion. Of special note are photographs of the altar at the shrine on Postectli, including explanation of the symbols and objects on it (photograph 12). Also, the practice of creating and honoring sacred paper effigies of the deities involved in the ceremony is explored in some depth. Paper has traditionally been a sacred material among the Nahua tribes, and paper representations of objects in worship is a very old practice indeed. Additionally, there is some detail on tobacco and drink offerings, as well as the use of music and the grueling test of endurance inherent in the extended preparation and performance of this ritual. A key part of the article’s focus is on the modern practice of animal sacrifice and blood offerings that survive among the Huaxteca today. These forms of worship have by no means been stamped out among the indigenous people of Mexico, as Sandstrom documents. (Yes, there are photographs in case you are wondering — scholarly, not sensationalistic.) Offering turkeys is something that has been done since long before the Conquest, and from what I have read they remain a popular substitute for humans in Mexico. It’s fitting if you know the Nahuatl for turkey — if I remember right, it’s pipil-pipil, which translates to something like “the little nobles” or “the children.” If I’m wrong, someone please correct me, as I don’t have my notes on the Nahuatl for this story handy at the moment. They got that name because in the myth of the Five Suns, the people of one of the earlier Suns were thought to have turned into turkeys when their age ended in a violent cataclysm, and they survive in this form today. I doubt the connection would have been lost on the Aztecs when offering the birds. To wrap things up, Sandstrom’s article was a lucky find and is a valuable glimpse into modern-day indigenous practice . I strongly recommend stopping by FAMSI and checking it out, as my flyby overview of it can’t possibly contain everything of interest. On one last detail, I strongly encourage you to read the footnotes on this one — a lot more valuable info is hidden in those. I think it’s time for retelling another myth, Cehualli-style. Chronologically, this one follows immediately after the tale about how Quetzalcoatl recovered the bones from Mictlantecuhtli in the great cycle of creation myths of the Aztecs. In this story, the age of the Fifth Sun has just begun, and the humans have just been brought back to life. So now there’s dry land, light, and living people again, but the recreation of the world isn’t done yet, for the people have nothing to eat. The legend of the Origin of Corn shows how the Teteo solve this last problem and complete the restoration of Earth. The Teteo stepped back to admire their work. They looked up to the sky and saw the Sun, radiant and majestic as He moved across the turquoise-blue sky. They looked down below and saw the jade-green earth, full of life, bounded on all sides by the Sacred Waters of the sea. They saw the newly-reborn humans, gazing back at Them with awe and gratitude for what They had done. Then the gods realized that Their work wasn’t done yet. “We’ve brought the people back to life, but it will all be a waste if they don’t have something to eat! Mictlantecuhtli and Mictlancihuatl will Themselves die of laughter if the bones They covet so badly return to Them this quickly,” said Xolotl, shaking His canine face in dismay. “The different kinds of food that we’d given the people in the previous four Suns won’t be right for these, for these are true humans,” said Tlaloc, the Lord of Rain, His voice a rumbling growl like a jaguar. “We need to find the real corn for our new servants.” His words were correct, for in the past ages of the world, only lesser plants that mimicked corn existed, just like how real humans weren’t yet made. Quetzalcoatl stroked His feathery beard, deep in thought, His eyes downcast. Right when He was about to speak, His gaze fell upon a tiny red ant… which was carrying a single kernel of corn. “I think We may have just found the true corn…” And with that, He descended back to the mortal world, leaving Tlaloc and the rest of the gods to watch what happened next. “Wise ant, where did you find this corn?” Quetzalcoatl politely asked the tiny creature. The ant looked up at the god, surprised to see a Teotl talking to her, but she didn’t answer. Instead, she just kept on walking, not relaxing her grip on the corn at all. Undeterred, Quetzalcoatl turned himself into a black ant and followed after her. At last they came to the foot of a soaring mountain. The red ant walked up to a tiny crack at the base and gestured to it with her antennae. “This is the Mountain of Sustenance. Corn, beans, chili peppers, and everything else that’s good to eat is stored inside.” Quetzalcoatl thanked her for her guidance and entered the mountain. Once inside, He gathered up some corn and brought it back to the heavenly world of Tamoanchan. The rest of the gods were delighted by Quetzalcoatl’s discovery. “Our servants will live after all. Quick, let’s give them the corn!” They said. Quetzalcoatl took the maize and chewed it until it was soft, then gently placed it in the mouths of the newborn humans who were weak with hunger. Strength returned to the people, who praised the gods. Meanwhile, Tlaloc and His ministers, the Tlaloque, were walking around the Mountain of Sustenance, examining it. “Now, what should We do with this?” He murmured to Himself, a hint of greed in His thunderous voice. And that is how the right kinds of crops for humans came to be. Here’s the video of the Aztec dance performance of part of the story of Quetzalcoatl’s descent to Mictlan, the Land of the Dead, to retrieve the precious bones so that humans can live again. It’s a nighttime performance, which is a perfect fit for the setting. Mictlan was described as a place of perpetual darkness, coldness, and night. The lighting is mostly from the bonfire and a few lamps, so it’s very moody looking and the shadows and light accentuate the motions and costumes of the danzantes. Go HERE to watch the dance, as YouTube seems to have yanked the plug on embedding this particular video. Quetzalcoatl is portrayed by the dancer in the birdlike, beaked mask who’s carrying the serpent, while Mictlantecuhtli is played by the dancer with the lion’s-mane-like headdress with a skull in the center of the fan of feathers. Mictlantecuhtli’s servants are creatively portrayed by children in skeletal costumes. You’re probably wondering “Why kids? That’s not scary!” I think they’re echoing the myths that portray Tlaloc’s helpers, the Tlaloque, as miniature versions of the goggle-eyed Rain God. If Tlaloc’s assistants are mini-Tlalocs, then why not have the Lord of the Dead’s be miniature Mictlantecuhtlis? Either way, it’s a nice casting choice.